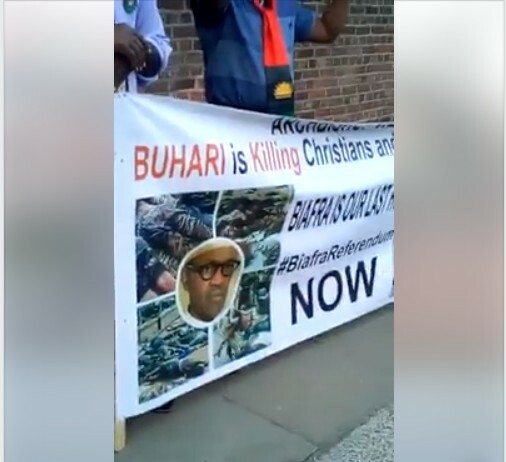 Few days after President Muhammadu Buhari proceeded for a 10-working day vacation in London, protest has already begun against him by pro-Biafra agitators again. 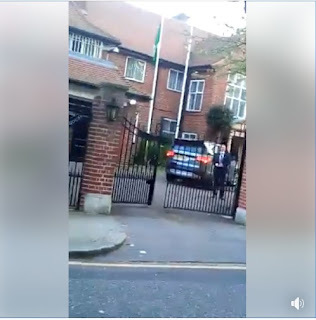 Some members of the Indigenous People of Biafra, (IPOB), stormed the Abuja House in London on Sunday (yesterday) to protest against him as the president was about to receive some visitors. In a video footage posted online, the pro-Biafra protesters were heard shouting 'Shame' and calling the president a terrorist and also Boko Haram sponsor. The protesters said that the president should go back to his country and should be ashamed of himself. This was happening while some visitors were entering the Abuja House to visit the president. A white security personnel was also seen standing at the gate as he watched the few IPOB members protest. Useless people u will never end well. 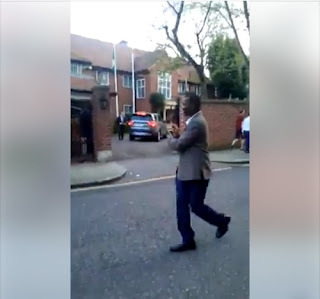 Ur parents stole our money build and buy houses for u to continue living in England God punish ur mama heartless cabals who no nothing beside looting to save in abroad President MBuhari is taking us to promise land. Talking about Noko Haram ask former President Goodloluck Ebele Jonathan from 2010 to 2015 Bharam was formed from ur people of the Southeast and Southsouth to reduce the population of the North so that u can continue Ruling Nigeria. To tell the whole world the truth u people killed more than 3000 Muslims in the North and it is still the quanciquancis we are facing till date, if the Government pursue them from one part of the north they will move to another part of the north (still in the north). So u can't deceive us stay there and enjoy ur looting money as we, we are restoring country legacy and mind u even if u come back we put an end to any useless and unreasonable Nigerian from looting our Tresury.